The F-35: Time to Go Back to the Drawing Board? The F-35, is it a flawed design? US Navy photo. The F-35 Joint Strike Fighter has long been seen as a fifth generation fighter that will provide the ability to ensure air superiority for decades to come. The only trouble however, is that the F-35 is a flawed design that is just becoming too expensive at a time when the military needs to be able to do more with less resources. In an age of austerity the biggest headache for defence planners is how to ensure air superiority, whilst also cutting back defence budgets and preventing them from becoming too bloated and out of control. The F-35 was designed with the specification to be a multi-role stealth aircraft, able to act as both a fighter and a bomber aircraft. But on the modern battlefield specialization is often the key and the F-35 appears to be attempting to do too much at once. One critic in the prominent magazine Foreign Policy has even described the F-35 as ‘a virtual flying piano’. In comparing the F-35 to current forth generation aircraft he states that ‘the F-35 lacks the F-16's agility in the air-to-air mode and the F-15E's range and payload in the bombing mode, and it can't even begin to compare to the A-10 at low-altitude close air support for troops engaged in combat’. Whilst defenders of the F-35 may argue that its superior technology will make up for these shortcomings, the reality is that the F-35’s complexity means that the planes will spend less time fully operational because it takes longer to train pilots, and the complexity of the plane means that it will need considerable time for maintenance. It is also difficult to see under what circumstances the F-35 will be needed. The American air force now trains more pilots to fly drones than it trains actual fighter or bomber pilots and drone warfare is almost certainly the future. Drones are able to fly for longer, cost less to build and do not risk the lives of the pilots who fly them. If the F35 is being built to counter similar Russian or Chinese fifth generation fighters than defence planners should worry about placing their faith in a plane which has numerous design flaws. 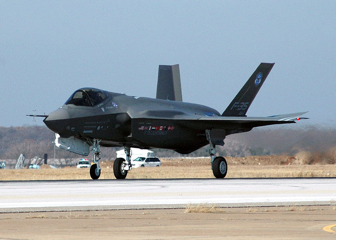 Defence Management Journal reported in early 2012 that the F-35 still has many problems with its arrestor gear, fuel dump systems, and the helmet-mounted display system, among others all of which call into question the ability of the F-35 to act as the prominent defence jet for the US and its allies. A French Dassault Rafale landing on a US carrier. With hindsight Rafale jets would have been a better choice for Britain. US Navy photo. For Britain the F-35 is seen as the replacement for the recently scrapped Harrier jump jet, which will allow Britain to equip its new Royal Navy aircraft carriers with the latest fighter jets. The Labour government had decided on the jump jet F-35B variant, when the coalition came to power they then changed this decision to go with the carrier version, the F-35C. 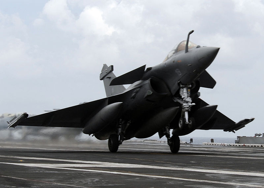 In theory this was an intelligent decision that would have allowed French Dassault Rafale jets to land on the carrier so the two countries could share resources. This would have meant the UK could work closer with France a key ally with which the UK signed a defence treaty with in 2010. The coalition’s decision would have meant that the new carriers would have needed to be converted with ‘cats and traps’, catapults that allow for the F-35C to be able to take off and land properly. Despite having already spent around £50 million pounds on choosing the F-35C the coalition has however recently announced to scrap this decision and go back to the Labour governments original choice of the F-35B variant. Considering that each F-35 plane will cost an extortionate $160 million perhaps with the benefit of hindsight the UK should have built carriers with catapults from the start and chosen the French built Rafale plane. A plane, which is already proven, costs $4-5 million less per unit than the Eurofighter and would have allowed the UK to strengthen its defence ties with France. For the US the cost of the F-35 is also spiralling out of control. For the price of one F-35 plane the US Navy could buy three F-18 Super Hornets and the cost of the F-35 procurement programme is the same as the Pentagon’s next fifteen largest procurement programmes. Rather than spending huge amounts on the F-35 a plane that has seen numerous delays and technical problems the US could stick with the tried and tested F-16 fighter. Surprisingly the US does not have the most advanced F-16 fleet; instead the United Arab Emirates currently holds the distinction of having the most advanced fleet with the F-16 E/F variant. Perhaps the US would have been better off spending more on research and development on both drones and updating the F-16. Increasingly the F-35 is looking like a disaster, the US needs the most up to date technology, but the F-35 has consistently suffered from technical failures and an extortionate price tag. If the F-35 was an outstanding plane then its price tag would probably be justified by the planes performance. The reality however is that the F-35 is a continuing disappointment at a time when military budgets can not afford to waste money on procurement projects that do not live up to such high expectations. After Afghanistan: Where Next for Britain and NATO? Diego Garcia: Just a Tropical Paradise?